I am fascinated by art journaling and can spend many happy hours surfing the internet looking at pages and journals or reading all those magazines. I have taken several online classes from some of my favorite art journalers - Teesha Moore and Jane Davenport, Kelly Kilmer, Mary Ann Moss. I did 21 Secrets last year and may do that again - I'd also love to give Lifebook a try. So many classes! But money doesn't grow on trees and when I discovered that, lo and behold, there was a local art journaling group/class right here in my small town, (who woulda thunk it??!!) I decided that would be the best place to spend my dollars. Take a class, support a local business and meet real people in my area that love artsy stuff as much as I do. Win-win! Last week was my first class and we are making altered books as art journals. I have NEVER done this before but so far I am liking it. I have been tearing out pages and gluing pages together getting the book ready. Here is the first spread. We started with gesso, then finger painted with acrylics. Then I doodled the flowers using black and white paint pens. Later, at home I added the stamps and writing and some extra work with markers. Have you ever worked in an altered book? I love shopping local to support my area, however I really prefer to learn on my own and do art with no one around!! I can focus better! Beautiful pages!! My daughter got (a catalog of watches)bound book with thick pages that was thrown away, it's so amazing for painting on. I was so happy with the results!! I never realized how fun it could be altering pages! Hope you meet a fun tribe of artists! This really turned out beautifully. I like your process too. I am thrilled that I found your blog through Julie Fei-Fan Balzer! Your painting is so artsy, and absolutely beautiful! Really nice work! I blog too http://www.schulmanart.blogspot.com if you want to check it out! Your pages are lovely, I love those doodled flowers. You're so lucky to have found a local art journaling class! I wish I had one here. Thanks for your really encouraging comment on my blog :) Glad I found you too. Pretty pages, it sounds like a fun class. 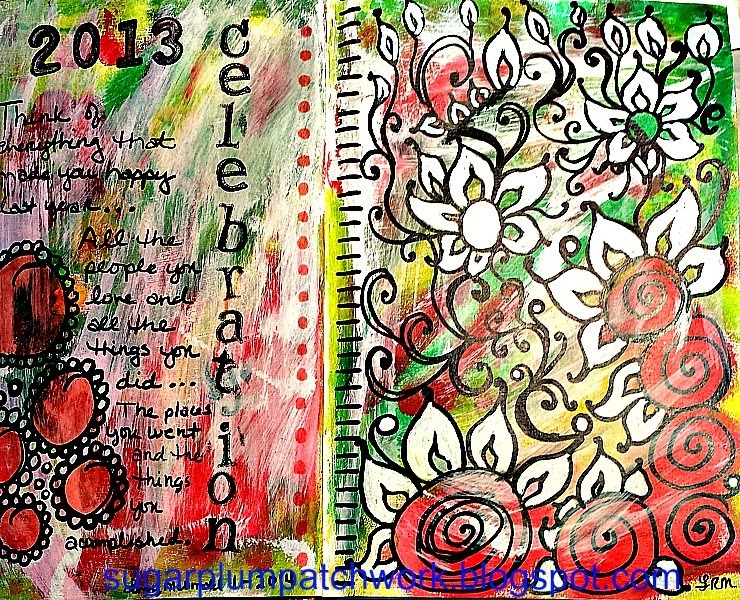 I love altering books, it's the best art journals!